Fundamentals of Research in Criminology and Criminal Justice: With Selected Readings, by well-known researchers Ronet D. Bachman, Russell K. Schutt, and Peggy S. Plass, is a unique resource for understanding the multifaceted subject of research methods in the field of criminology and criminal justice, amply illustrated by carefully selected and edited research articles from the leading journals in the field. Each of these articles features an introduction, written to draw the student’s attention to the specific concept(s) from the chapter that are illustrated in the article, and a series of questions about the article, designed to help the student think critically about and reflect on these concepts. In this way, students not only learn how to conduct research, but also learn why it is important to do so. 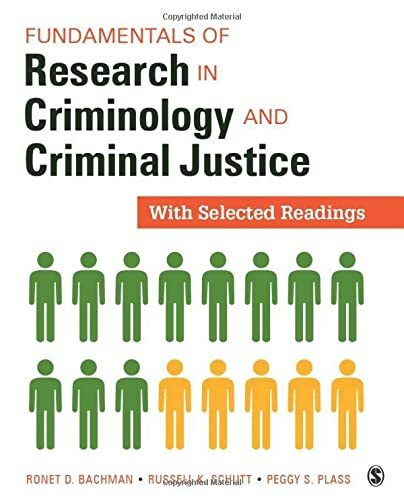 Building off the widely adopted Fundamentals of Research in Criminology and Criminal Justice, the additional readings increase students’ understanding of complex issues being investigated in the field today and how those issues are being researched. Additional instructor resources and study tools can be found online at study.sagepub.com/bachmanfrccjsr. Ronet D. Bachman, PhD, worked as a statistician at the Bureau of Justice Statistics, U.S. Department of Justice, before going back to an academic career; she is now a professor in the Department of Sociology and Criminal Justice at the University of Delaware. She is coauthor of Statistical Methods for Criminology and Criminal Justice and coeditor of Explaining Criminals and Crime: Essays in Contemporary Criminal Theory. In addition, she is the author of Death and Violence on the Reservation and coauthor of Stress, Culture, and Aggression; Murder American Style; and Violence: The Enduring Problem; along with numerous articles and papers that examine the epidemiology and etiology of violence, with particular emphasis on women, the elderly, and minority populations as well as research examining desistance from crime. Her most recent federally funded research was a mixed-methods study that examined the long-term desistance trajectories of drug-involved offenders who were released from prison in 1990, followed from 1990 through 1995, and interviewed again in 2009. Plass, Margaret (Peggy) S. (Suzanne), Schutt, Russell K., Bachman, Ronet D.